The work patterns of European women from 1700 onwards fluctuate in relation to ideological, demographic, economic and familial changes. 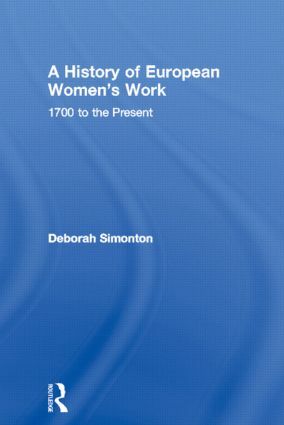 In A History of European Women's Work, Deborah Simonton draws together recent research and methodological developments to take an overview of trends in women's work across Europe from the so-called pre-industrial period to the present. Taking the role of gender and class in defining women's labour as a central theme, Deborah Simonton compares and contrasts the pace of change between European countries, distinguishing between Europe-wide issues and local developments.